With Actinic, One Stop Order Processing, One Stop Automation you can automate most of your order processing tasks including drop shipping. This guide explains how it can be setup. This document requires some knowledge of Actinic and Mole End's One Stop Order Processing and One Stop Automation. However, this guide does explain all the steps to follow in setting up a Drop Shipping system. You can use One Stop Automation with One Stop Order Processing and Order Status Checker to create automated tasks that fit in with how you currently run your business. If you look at any of your current tasks and can see that you do the same operations in the same way each day (which does not require any reviewing of the order information) this can probably be automated. Following is a description of how the software can be used to automate the Drop Shipping, Customer contact and Order Tracking areas of an Actinic site's business.This example uses a drop shipping company but is also applicable to companies that despatch goods from their own location. A company sells 250 different types of items on their website and despatches them from a remote warehouse, using a Drop Shipping company. To be able to leave the internet shop to run itself, including order processing, customer despatch emails and order tracking. This will enable them to focus on answering the telephone and dealing with new products. Also to resolve any delivery problems (once notified about them). The Drop Shipping company is emailed a CSV file containing all the order details (for UKMail) along with the packing lists twice a day along, at 11am and at 4pm. The Drop Shipping company prints the packing slips to send out with the orders and imports the UKMail consignment details into Consignor to print the courier labels. NOTE: You should create a folder on drive C called DropShip (i.e. C:\DropShop). This is where all of the external files are stored to handle the drop shipping process. 1 Setup One Stop Automation click Options and select the Scheduler tab and add the following tasks. These tasks will automate the order processing features. CMD /C "C:\DropShip\Despatch.cmd -S "<Site>" <Window>"
2 In the Order Processing Options tick. Run Program at End of Processing and select When the program exits. 3 Close the options. 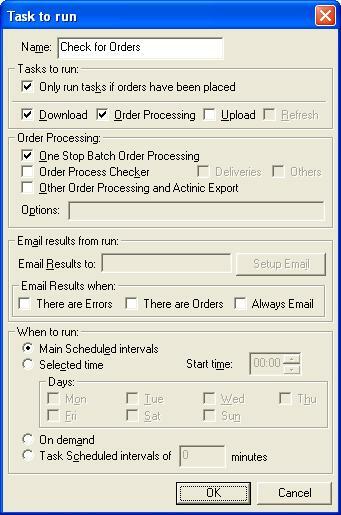 Click on Batch Order Processing (on the main One Stop Automation window). This will automatically ship orders, format addresses, email PDFs of invoices to customers and mark the packing list as printed. NOTE: You should also setup your email (to use smtp). Thank you for your order. Your invoice is attached to this email (as a PDF). 8 To update the delivery status of shipped orders (and then automatically send the customer a despatch email) you need to check the courier website. Click on Order Status Checker and click on Options. In the Orders to find box select the Order Colour is not set option. In If an order has been found and delivered box select Set Order Colour to and click on Get colour from Hilight colours and select a colour to show that the order has been delivered. 11 Setup One Stop Order Processing with the filters, email templates and views. Start One Stop Order Processing. 12 Click on the Options button and click on the Email Customers tab. 13 Create the drop shipping email. Click on New and enter the following values for the email template. When created take a note of the order it is in the list and subtract 1. For example, if this template is 5th in the order in the list this can be referenced b using a value of 4. 14 Create the order despatch email. Click on New and enter the following values for the email template. Your order will shortly be dispatched and should be at the Delivery Address shown below by the end of the next working day (Monday to Friday). When created take a note of the order it is in the list and subtract 1. For example, if this template is 6th in the order in the list this can be referenced b using a value of 5. 15 Setup the view to export the information from (in this example UKMail). Select the Business Post view. 16 Setup any filters that will only show orders that you actually want to process (e.g. paid for orders) and click Refresh. Then click on the top left of the main window and select the Use Current Filter for Command Line Export. 18 In the Name field (next to 1) type in DropShip and click on the Assign button on the right hand side. Click OK. This filter will only show orders that have not been exported. When orders are exported the word EXPORTED is included in the order memo. 19 Refresh the orders and again click on the top left of the main window and select the Use Current Filter for Command Line Export. 21 In the Name field (next to 2) type in Despatch and click on the Assign button on the right hand side. Click OK. This filter will only show orders that have not had their despatch email sent to them and have have a consignment number. The consignment number is updated in the order by the Order Status Checker (from the courier website). 22 Click on the Options button and select the Export Reports button. 23 In the File Options area select Create 1 file for each order and select the PDF format. as the Output directory. click OK. When the information is sent to the drop shipper this will put all the packing lists into the C:\DropShip\Export folder. The email will attach any files in this folder to the email sent to the DropShip email. This will put a unique file to attach to the email and put the current time and date in the filename. This will add text to the memo when exported. This is used in the filter to find orders to process. 27 You can now close One Stop Order Processing. You should always close One Stop Order Processing on the PC when it is being called by One Stop Automation (or One Stop Automation will not work correctly). 28 On the PC create a folder called DropShip (i.e. C:\DropShip). Then create a folder under C:\DropShip called Export (i.e. C:\DropShip\Export). REM ** Remove old files used for export. REM ** Create UKMail Consignor file for all orders not exported (memo does not contain word EXPORTED).. Uses filter 1. REM ** Email Drop Shippers CSV file and exported PDFs for packing lists. Uses filter 1, same as above. REM ** Email Drop Shippers if no orders have been found (saying no orders to process). Uses filter 1, same as above. You will need to create another email filter (here it is the 8th one) that says no orders to process.